This leaf from a twelfth century French psalter is without illumination or decoration of any kind. Measuring 21 x 15cm, the vellum is very yellowed, brittle, and hard, with lining in ink and brown ink for the text. The script is described by Ege as Caroline minuscule. The text is highly abbreviated, and has proven singularly resistant to identification and transcription. 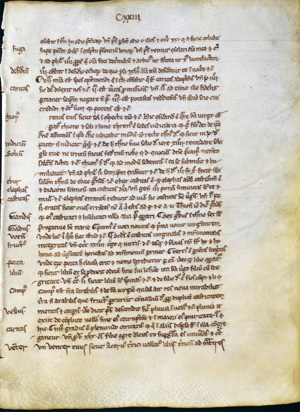 See Denison University Leaf 04 for more information about this manuscript. A scan of the recto of this leaf is currently unavailable. A transcription of this leaf is currently unavaliable.